For Pretty Ballerina lovers who like a shoe with a bit of an edge. 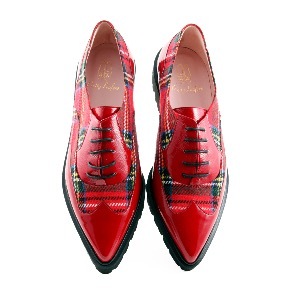 This red tartan lace-up is a head-turning statement shoe. Super lightweight and available in half sizes for perfect fit. Buy a half size larger than normal due to the pointed toe shape. Pretty Ballerinas and Pretty Loafers are labels from Mascaro, founded in 1918 and now run by the third generation of the Mascaro family. Everything is lovingly crafted from the finest Italian and Spanish leather with the highest importance being placed on fit, style, comfort and quality. This covetable label has graced our shelves for over 15 years and our love affair is unwavering due to it's directional but feminine style and all-day comfort. Mascaro has over 90 stores in 22 countries on 5 continents.